PEGAS had been noting for some time the unusual number of great ape bone and skull seizures being announced by LAGA in Cameroon, wondering what was going on. This Al Jazeera article explains that ape parts are increasingly being used in “mystical” ceremonies involving Nigerians and that trafficking networks now run across the border to big cities in neighboring Nigeria. 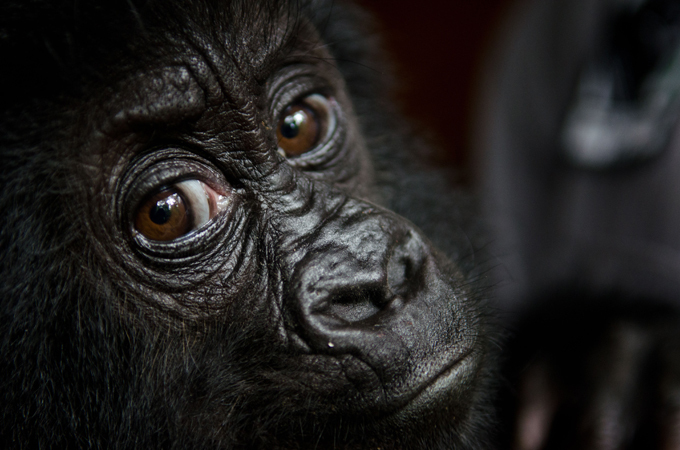 This is a frightening new development that threatens great ape survival even more. For years, traffickers fueled the slaughter of gorillas and chimpanzees in Cameroon’s rainforests to meet demand for bush meat – an activity conservationists feared could wipe out the great apes in the wild in a few decades. But now they fear a far worse scenario is taking place. A previously unknown trade in ape heads, bones and limbs – rather than full bodies for meat – is encouraging poachers to kill more animals than previously done, and wildlife law enforcement officials say it is speeding up population decline. “We may be looking at something that is developing down the road of ivory trafficking,” said Eric Kaba Tah, deputy director of the Last Great Ape Organisation (LAGA), a non-profit wildlife law enforcement body based in Cameroon’s capital, Yaounde. “Gorillas and chimpanzees were hunted mainly for bush meat. The babies were captured and sold as pets. Heads and limbs were cut off and left behind because they resemble human parts,” Tah told Al Jazeera. However, a new picture has now emerged. “What we are seeing increasingly is that poachers are recovering the heads and limbs of chimps and gorillas and leaving the bodies behind to rot,” said Tah. Anti-poaching campaigners fear this trend will increase pressure on the already dwindling population of gorillas and chimpanzees, and are warning the great apes could disappear “in our lifetime”. “Body parts are easier to conceal and transport. Because of this, poachers will be tempted to kill more animals than they already do,” Tah said. The exact number gorillas and chimpanzees roaming Cameroon’s forests is difficult to estimate because researchers have conducted few studies. But wildlife officials say there are only a few hundred per species. One estimate puts the number of Cross River gorillas in the wild at less than 300. In the past four months alone, game rangers and security forces have arrested some 22 ape traffickers with a total booty of 34 chimp skulls and fresh heads, 24 gorilla skulls and heads, and 16 ape limbs, according to LAGA. Others have been arrested with jaw bones and other parts. “If the situation continues, great apes may no longer be around in 10 to 15 years,” Tah said. 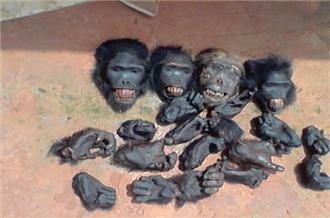 It is still unclear what is driving the demand for ape parts. However, wildlife officials and anti-poaching campaigners say they have found a connection between the illegal trade and Nigerian communities inside Cameroon and across the border. “We think ape products are being used for mystical practices,” said an official at the ministry of forestry and wildlife, who did not want to be identified because he was not authorized to speak to the press. Trade in ape parts is not entirely new, though it is only recently that law enforcement agents have uncovered “sophisticated and well-organized” trafficking of ape skulls, heads, limbs and bones. “The more we crackdown, the more we see things that were unknown to law enforcement officials,” said Tah, whose organization has been helping the government of Cameroon to fight wildlife crime for the past 10 years. “We decided to focus on the trade in ape parts this year, and as a result we uncovered the magnitude of an old phenomenon,” said Ofir Drori, founding director of Eco-Activists for Governance and Law Enforcement. “If we had done this in Congo, Gabon, Democratic Republic of Congo, Central Africa Republic or [any] other country, I am sure we would get the same result. The work in the last months in Cameroon has shown how organized and socialized the ape trade is, and exposed a worrying magnitude,” Drori told Al Jazeera. 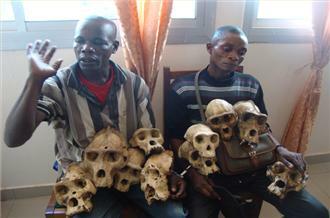 Traffickers were mainly small-time poachers and dealers, police official Julius Anutemet said. But over the years, they have become skilled, well-funded and organized. Networks now run across the border to big cities in neighbouring Nigeria and a few powerful people could be involved. “These are professional traffickers, people who live entirely off the trafficking they do,” said Anutemet, who has hunted wildlife traffickers since 2003 and made about 580 arrests. Traffickers are now arrested on a weekly basis. Yet, the crime goes on. Catching people up the chain is often easier said than done, Tah admitted. Widespread corruption means the powerful men behind the crimes are never caught, or get away with “ridiculous fines”. “When you see some court decisions, you are forced to ask if there are other reasons other than legal considerations,” Tah said. The penalty for illegal poaching and trade in protected wildlife is one to three years imprisonment, or a combination of jail time and a fine of up to US$20,000. But anti-poaching campaigners say arrested traffickers often walk away with less than the minimum punishment. LAGA estimates that corruption is a factor in about 80 percent of the legal cases the organization has helped to build. This entry was posted in body parts trade, Cameroon, Cross River Gorilla, LAGA, West Africa and tagged body parts trade, Cameroon, Cross River Gorilla, LAGA, West Africa. Bookmark the permalink.